Also see our Value Packs Value packs offer tremendous savings over buying individual items. 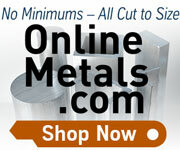 Get everything you need to start using your bench top lathe or milling machine. Also see our Outlet Store In our outlet store we offer items that have been returned, have cosmetic blemishes ("scratch and dent"), have been refurbished, are missing a component, or for some other reason are not good enough to be sold as new--all at a greatly discounted price. 2983 Electronic Digital Caliper, 6"